My mom and dad, for supporting an overwhelming bike riding habit. My sisters and my brother, because I haven’t seen them in over a year. My 93-year old Ukrainian grandmother, who is a connection to another place that inspires me to live simply, to want and need less, and to eat better. Lael’s parents, for putting us up this winter and always supporting the overwhelming bike riding habit. Cass Gilbert, for continued support and inspiration. Tim Joe Comstock, aka the Trailer Park Cyclist for exceedingly witty and supportive comments and being the most prolific commenter on the blog. Joe Cruz, for riding his fat-tired Pugsley around Alaska and South America and showing us all that it’s not that weird. Gary Blakely and Patti Kelly, for being on the leading edge of it all. Gary and Patti are listed on the ACA Great Divide Maps as a host to cyclists in Del Norte, CO, and provide more support than any single person or resource to Divide riders and racers every year. Gary is an infinite resource for sensible bikes, lightweight gear, and regional inspiring rides. Chris Harne, for teaching me that steel-body Shimano SIS derailleurs, Falcon/Xundah thumb shifters, old ATB’s and steel north-road style handlebars are where it’s at– as Lael says, “turning thrift into style”. And, an ability to be honest with his writing in a way that makes his readers believe him, and blush. Mike Shupe, owner of The Bicycle Shop in Anchorage, AK, for helping to keep bikes on the streets and riding almost every day of the year, forever. Mike has been selling and riding bikes since before the 70’s bike boom. He hosted Ian Hibell for a week back in the late 60’s. Greg and June Siple of the Adventure Cycling Association (and Hemistour and TOSRV), for their contribution to cycletouring in America. Colby Sander, an Alaskan at heart and a Tacoman by residence, for storing (and listening to) my record collection, indefinitely. It’s much too heavy to carry around on the bike, but too much of a treasure to give up completely. Colby is the most soulful guitarist I’ve known, learning to play to cassette tapes of Stevie Ray Vaughan and Jimi Hendrix as a kid. These days, he mostly plays the dobro, pedal steel, B-Bender and the trusty old Telecaster from his childhood. Lucy Kruesel, Sean Camfield, Daniel Aplin, Josh Hegg, Alex Dunn, Tamra Kornfield, Erin Deimon, Nate Bosch, Greg Mu, Jane “Glacier Buddy” Douglass, Sam Esecson, Ben Hulet, Noah Struthers, Alec Burney, Robert George, Kyle Sheehan, Jeremy Humphrey, and Christina Grande– these are some bike friends from all over the place. I’m in the process of tracking down hosts from all over the world from the last four years. Those that I can find may also receive some color, finally. And Lael, who is the best riding partner I could imagine. She could probably use one as a bookmark. If you aren’t listed above and would like a postcard from the road and a splash of color for the refrigerator, send your name and address along with a friendly note to nicholas.carman@gmail.com. Free, while supplies last. Cass, TJ, Joe, Gary, Josh, Alex, Lucy, Daniel, Jeremy, Erin, Greg, Ben, Jane, Nate, Christina, Sean, Tamra, Sam, Alec, Kyle, Robert, Noah and Chris– please send along a mailing address. If you happen to be touring at the moment, select a town with a post office about two weeks away. I’ll send it there in your name, general delivery. The neverending list of things to do before leaving the metro area is now a short list of loose ends. Need to puts Stan’s sealant in our tubes. Need to install a new SRAM PC-870 chain on the Pugsley. Need to install the Surly 1×1 bar with shifters and brake levers. Install another water bottle cage on Lael’s Raleigh. Swap stems and seatposts on the Raleigh; a little lower up front with weight forward over the bars might ride better– this is a bike fit. Ride some more. Is that better? How about the saddle angle? Reach? The pedals feel forward of the saddle. Slide it forward. Now, descend standing on the pedals. Climb. Pedal casually. It’s close to perfect but it still feels new. It’s a big bike compared to the Hooligan. The task of finding an appropriate used bike and dressing it for singletrack touring isn’t entirely complicated. Doing it on a budget between several cities with inconvenient transit systems is. There isn’t a bus directly from Fort Collins to Denver, even though an interstate highway spans the 65 miles between the two cities. It even requires two buses to reach Boulder, which is nearer. I was lucky to find a Craigslist seller that would meet me in the middle. I walked to the bus in Fort Collins, walked four miles in Longmont, and upon returning to Fort Collins in the evening I was forced to “velocipede” the bike several miles back home in the dark. I lowered the saddle and propelled the bike in a seated running motion. I now have a deep appreciation for the development of the chain-drive system. To meet Lael last week at the Denver airport required similar transportational creativity. First, to attend a meeting of the Denver Surly Owners Society (S.O.S.) I jumped on the bike in Fort Collins with a light load for the 65 mile paved ride to town. The Pugsley doesn’t fit on the bike racks found on many buses, so this was my only option. Leaving a few hours later than planned, I diligently sat on the bike to reach my downtown destination by six. Fifteen, sixteen miles an hour had me on track to arrive in time, when a headwind halved my progress. Pushing through the wind and the suburban armor of Denver, I finally crossed the Platte River into the heart of the city. A visit to a city’s center is essential, but the surrounding sub-urban layers have as much to say about the city as the core. The S.O.S. is a small crew of Denver’s cycling elite, with a healthy association of bicycle advocacy and bike-sharing. Denver’s B-Cycle bike-sharing program is the first of it’s kind in the country, and I was hosted for the evening by Philip who manages the fleet of 500 bicycles involved in the program. Philip recently tackled several days of the Colorado Trail on a 1×9 Surly Karate Monkey with a Salsa Enabler fork and a fat tire up front– half-fat. The S.O.S. group rode to Salvagetti, a hip local shop specializing in transportation cycling and featuring a host of Surly bikes, custom built to finer specifications than the standard builds offered. Salvagetti hosted a grand re-opening party at their new location; on display was the singlespeed Kona that local rider Justin Simoni rode in this year’s Tour Divide, finishing first in the SS category. Denver’s new airport is about thirty miles from the city center, seemingly in Kansas. I was able to put my bike on an $11 bus to arrive in time to meet Lael. Rejoined and rejoiced with my traveling companion, we left the airport on bikes. Very few airports are easy to access by bike, and Denver’s isn’t one of them, although technically it’s tolerable. The two-three lane highway exiting the airport has a generous shoulder and some bike signage, except when road construction channels traffic into a narrow corridor, excluding the shoulder. The responsibility to maintain the bicycle facility has been ignored through the phase of construction, presumably because very few people ride to the airport. Bikes just aren’t that important sometimes. The Albuquerque airport is located only three miles from the main east-west boulevard in town; I was able to shoulder a large bike box for the three mile ride through neighborhoods, to package my bike for flight in the airport lobby. I have ridden to or from airports in Paris, Boston, Seattle, Anchorage, El Paso and Pittsburgh. Pittsburgh will soon have a short connector trail from the airport to the Montour Trail, a main spur from the Great Allegheny Passage, which then connects to the C&O Trail and Washington D.C about 350 miles away. Riding through Denver in the morning is pleasant and a free bike map helps guide the way. We rummaged through used outdooor gear at the WIlderness Exchange, and found a new helmet for Lael at REI. With her new Giro cap, she looks like a short-track speed skater on a bike. Cooking on the sidewalk outside of REI, we dined on breakfast burritos made with fromage et saucisons from France. Lael also brought salted caramels, a kilo of grey sea salt, miniaturized homemade cornichons (pickles) and a bottle of calvados. We have been eating well. A bus to Boulder whisks us out of the city for a few dollars. The immaculately organized Boulder Community Cycles provides inexpensive used chainrings, v-brake levers, and stems; a cousin in Boulder provided a mailing address, where I received several packages. A friend picked us up to return to Fort Collins to begin building and rebuilding bikes. Back home, fixing bikes: derailleur hangers to transform the singlespeed to a geared bike and a new Velo Orange Grand Cru sealed cartridge bearing headset replaces a worn-loose ball system; used Race Face stem, Surly steel chainrings, and Shimano Acera brake levers from Boulder Community Cycles; a hard to find 30.0mm Salsa seat post clamp; Velo Orange thumb shifter mounts will accept the levers from my Shimano bar-end shifters and the $20 gold anodized On-One Mary handlebar. Lael loves her “Marys”. The last few days have been a lazy parade of swapping parts, tuning the ride and dialing the fit. However, there has been time for swimming and baking pies, visiting local breweries and bike builders. Fort Collins has a veritable bike zoo between Panda and Black Sheep Bicycles. More on that later. The bikes are riding, Lael is acclimating, and transportation to Interbike is in the works. It’s been a busy week, but it’s all coming together. I’m seeking a ride for two people and two bikes to arrive in Las Vegas sometime around Septempber 16-18 to attend the Interbike show, a bicycle industry convention. I’ve been bicycle touring most of the summer from Anchorage, Alaska and will be riding the Colorado Trail in the next few weeks. I can detour from the trail to meet in a nearby city or somewhere along the I-70 corridor (Glenwood Springs, for instance). Anyone from the Denver area headed west mid-Sept? Any help would be welcomed. I expect to share the cost of gas. Thanks. Tell your friends, especially those that enjoy gambling or bicycle industry conventions. Rebuilding a singlespeed 2008 16″ Raleigh XXIX as a 1×9 (32 x 12-36) with a gold anodized On-One Mary handlebar, Ergon grips, a new Velo Orange cartridge bearing headset, extra bottle cage mounts, a tenacious rider and not too much gear. Birthday on Wednesday. Lael on Thursday. Acclimate. Ride to the trailhead later this weekend. I’d been searching Craigslist primarily for a used steel 29er, with or without suspension and gearing. If you seek a similar steel 29er on the used market, consider Redline Monocog (SS, but replace sliding dropouts, has braze-ons for shift cables), Raleigh XXIX or XXIX+G (former is SS, replace derailleur hanger with Wheels Manufacturing 133 or Raleigh 5) , Surly Karate Monkey and Ogre (both have track style dropout with der. hanger), Salsa Fargo or Mariachi, Haro Mary, or On-One Inbred or 456. Further, Voodoo, Jamis, Soma, Vassago, Niner and Spot all produce steel 29ers that passed through the local used market this past week. I’ve got a Colorado Trail Databook thanks to Brad in Boulder. I’m living in Fort Collins for the week, which is a real bike town where people ride bikes to get places. Denver calls tomorrow with a meeting of the local Surly Owners Society (S.O.S. ), which I equate to the B.O.B. group with more beer and fewer lugs. 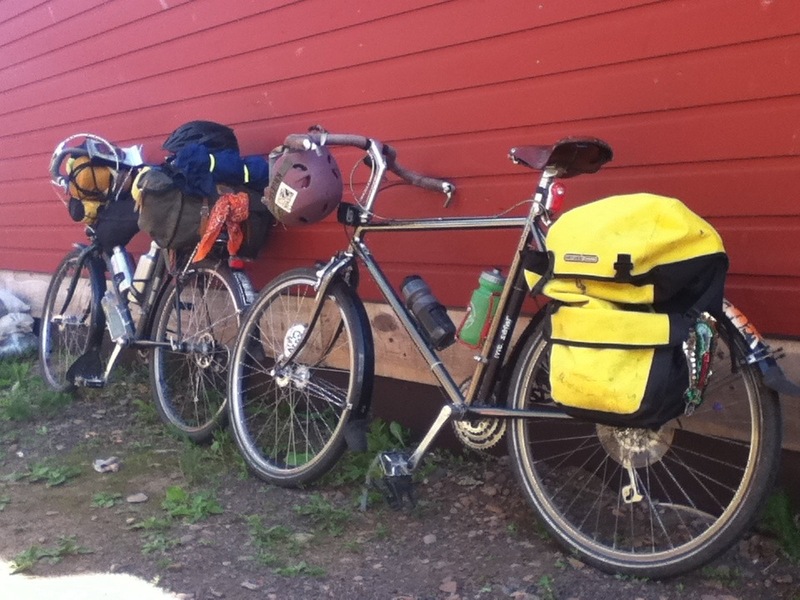 Amidst bike repairs and writing, I’m hoping to make it to Denver to meet the bearded, tattooed owners of Surly bikes. Otherwise, I’m fixing and riding bikes and staring at a Rock Shox Reba fork wondering if I should take it apart for preventative maintenance, and fun. It’s time for an upright handlebar on the Pugsley and a used Surly 1×1 Torsion bar will take the place of the Salsa Cowbell. I’ve considered a modern “mountain” drop-bar, but if your flatten and flare a drop-bar enough you get something like a Mary, Jones, Space Bar or a Carnegie. The Surly Torsion bar has a 15deg sweep and is manufactured in Cro-Mo by Nitto; Lael’s gold Mary is 35deg and is in the mail for $20 from the new US distributor of On-One equipment from the UK. On-One makes incredibly inexpensive frames in steel, aluminum and carbon, as well as some innovative handlebars (Mary, 35deg; Fleegle, 15deg; Mungo, mustache; and Midge, mountain drop). A steel 26″ or 29″ mountain bike frame can be had for $200 or less. Velo Orange thumb shifter mounts are the least expensive way to fit my Shimano bar-ends to an upright bar for easy, reliable shifting. Friction thumb shifters are king when simple, rugged shifting is needed. V-brake levers should be close at hand for a few bucks. She likes a nice pair of boots and a shiny brass bell, but she’s not all that fancy– she’ll sleep in barns and dugouts, atop mountains and aside rivers and is content eating a raw beet, seeds and some lettuce for dinner. We’re both gypsies, connecting the dots by bicycle. Another reason to reach Colorado, aside form the availability of water and shade, is that I’m still charged with the task of buying or building a bike for Lael. Her Surly Long Haul Trucker is much loved and well used, but the limits of the bike have been reached considering the “real” mountain biking we’ve got planned. With a 2.0-2.1″ tire the LHT is a very capable dirt road tourer and a light-duty trail bike, and still fits a fender. It remains in Anchorage and is in daily use by a friend in need of some wheels. My Schwinn High Sierra is providing the same service in Tacoma, WA. I like to give bikes out for permanent loan when possible. The potential to recover a few hundred dollars from a bike with considerably more utility seems wasteful when I can be assured the bike will be ridden daily. If she needs the LHT again it’ll be waiting in Anchorage, free of dust. Her Surly Pugsley was great fun and a great tool though the winter, allowing her to commute to work every day and to explore the local terrain. The elementary school she worked at was five miles away, and many mornings she was on the bike by 7:30. At this time of morning in Anchorage winters, you’ll encounter neither rain nor shine– it’s cold, dark and snowy. Leaving for Europe, she liquidated her assets and sold the bike. Mainly, the sale of the bike was a financial and logistical decision as shipping or flying with the bike was unreasonable, but her main complaint about the ride was that the wheels were heavy. I can attest to that, and my Marge Lite rims improve the ride and allow me to open up my riding style, especially with as much climbing as I’ve been doing. The week before flying to Europe, I bought Lael a Cannondale Hooligan on closeout sale at The Bicycle Shop. She’d been joking about it all winter (much truth…), and always hopped on for the “indoor criterium” circuit around the showroom floor. With the handlebars and fork removed, the bike packs to the shape of a cello and avoids airline surcharges. In spite of small wheels, the rigid frame and disc brakes are assuring and feel mostly like a normal bike. Unlike the “normal” bike she is used to, the small wheels and an overall weight of 24 lbs allow the bike to climb and accelerate easily, perfect for city riding and the steep pitches encountered in Corsica. Of course, it’s also easy to carry up stairs or onto the train, and is a fun conversation piece while in traveling. On different sides of the globe, we’re both peppered with inane questioning about wheels and tires– Surely, small wheels must be slower? And you must pedal two, or three times as fast to cover the same terrain? We’d like to keep the bike for future experimentation, but it is most definitely not the bike for the Colorado Trail and beyond. For that, we seek something more conventionally appropriate for the mountains. After years of commuting, cycletouring, and ATB-ing, this will be real mountain biking. 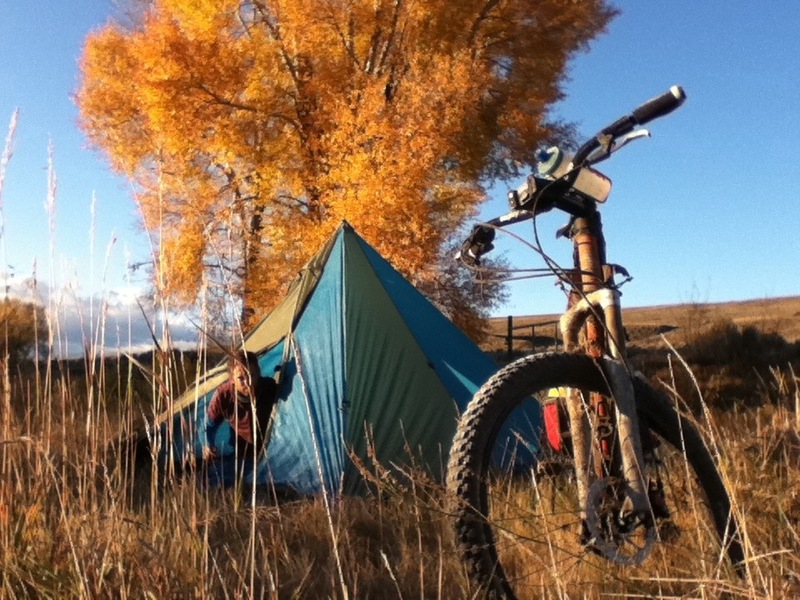 Lael arrives in Denver on the 23rd with lightweight bike luggage and camping equipment, but without a proper mountain bike. I’m looking for a new or used, steel or aluminum, rigid or hardtail, 26″ of 29″ wheeled mountain bike. I’d dreamed that we could both ride fatbikes with lightweight wheels, but finances are steering me towards sourcing a used bike from the Denver-area Craigslist. I’ve actually wanted to do this for quite a while– find a used bike en route, prepare it for travel, and ride away. Denver is a great place for this experiment and the Colorado Trail will be a worthy proving ground. Bikepacking on a budget! Several days before traveling to Europe, Lael raced the Skinny Raven Twilight 12K in Anchorage in a time of 47:40 (6:24/mi), and placed third in her division amongst a field of almost 1200 runners. She enters one race annually, and generally falls into a comfortable third place. Not bad for an occasional racer!